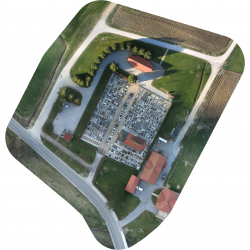 Realis, the developer of software solutions in spatial information systems, turned to Geavis for aerial survey and the production of new orthophoto maps for the spatial information system of municipalities PISO. 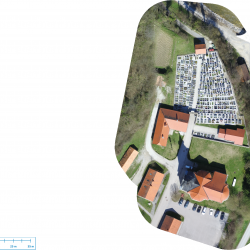 It is about updating orthophoto maps of six cemeteries in the settlements of Buče, Dobležiče, Kozje, Pilštajn, Podsreda and Zagorje – all in the municipality of Kozje. 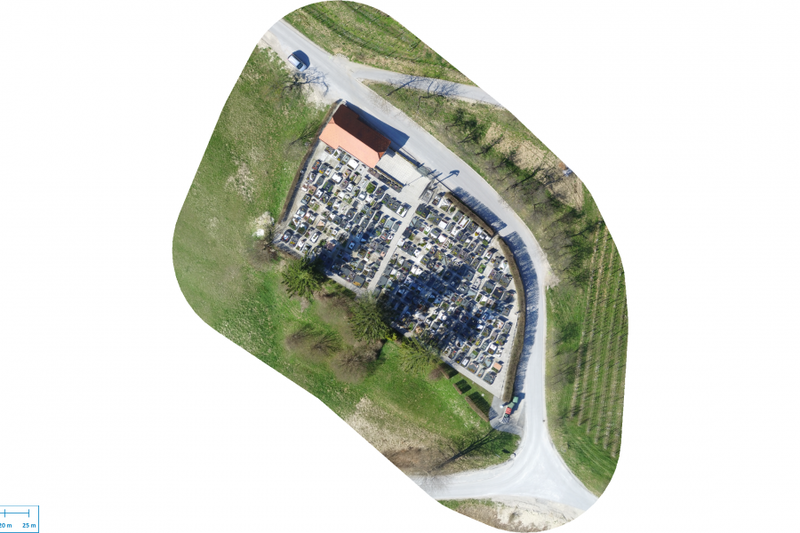 Updated orthophoto maps will be included in the Realis application PISO Cemeteries. 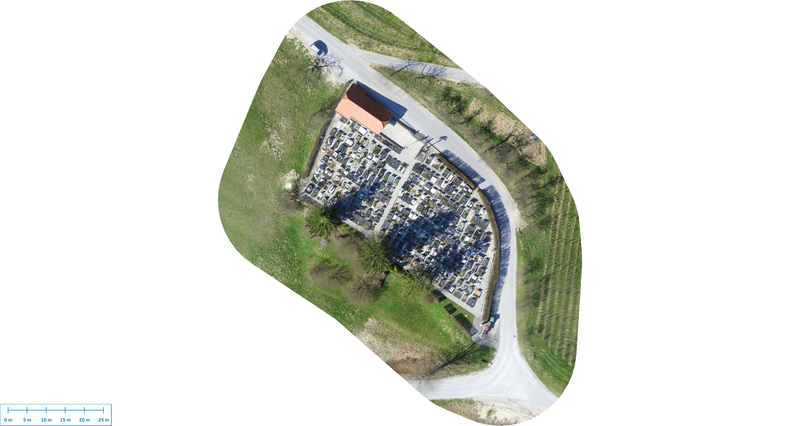 It is a module that enables municipalities and their municipal companies to manage and keep records of cemetery data. 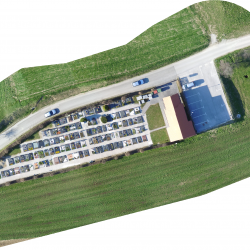 The customer’s expectations were to obtain high-quality orthophoto groundwork of high resolution and accuracy, since quality graphic displays are important for the PISO system. 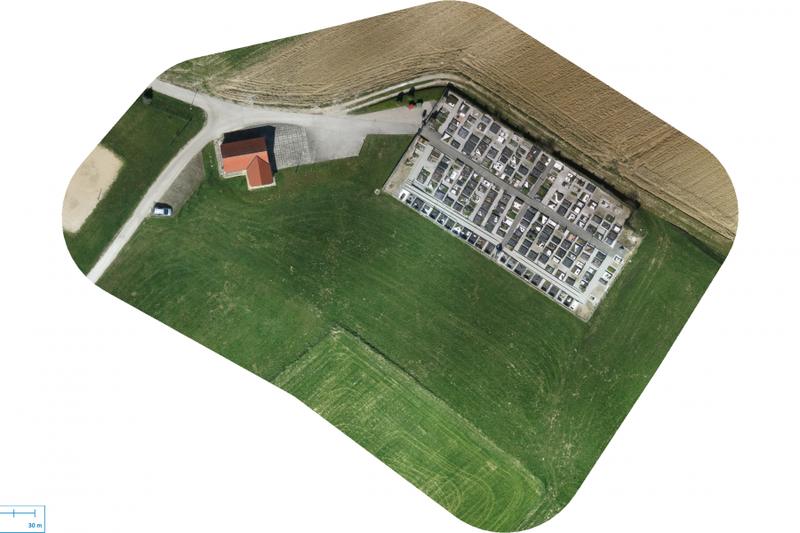 Geavis achieved this by deliberate planning and professional aerial photography. 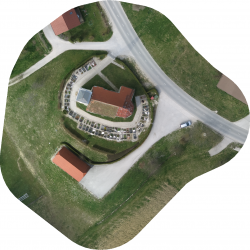 In order to achieve high resolution of orthophoto maps (aiming at 2.5 cm/px was expected), high overlapping (80 %) of aerial photographs was required. 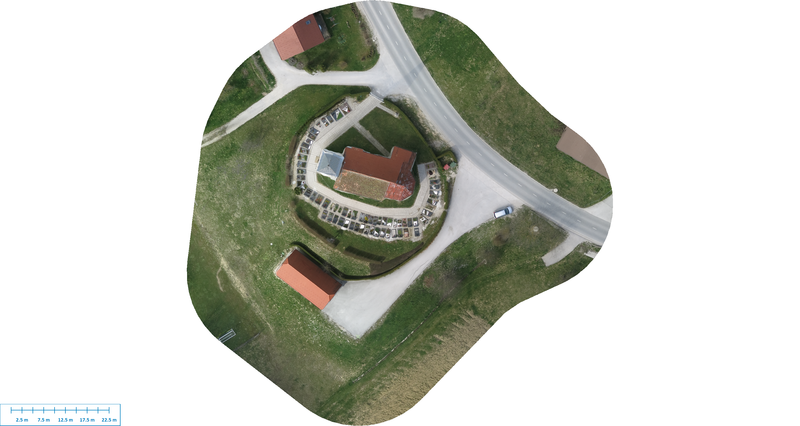 At a given speed of our unmanned aircraft, the distance between two successive aerial photos was too short for the desired overlap. The problem was solved by increasing the cross-lapping to a high 90 %. 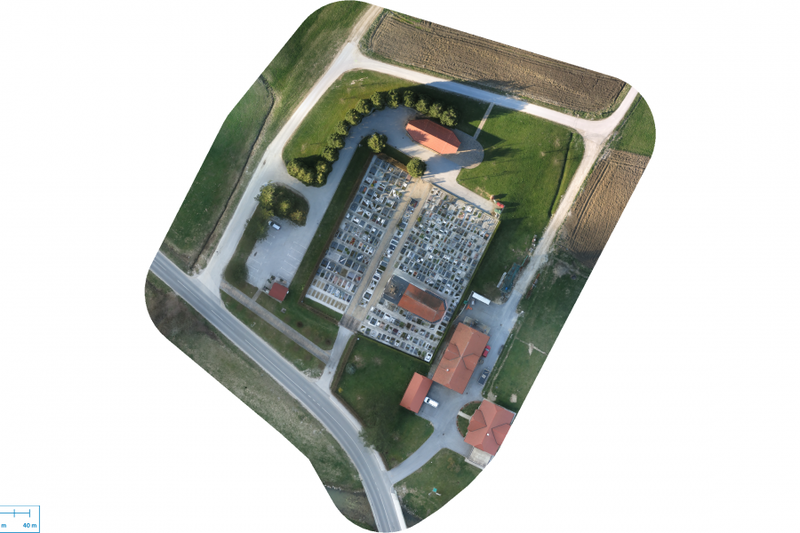 This allowed us to achieve a sufficiently compact network of aerial photos. 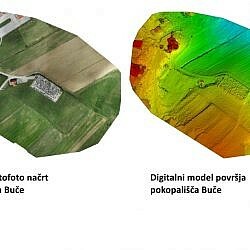 Each terrain point was recorded in at least five aerial photos, which significantly contributed to the high accuracy of the acquired geospatial data and the quality of the orthophoto plan. 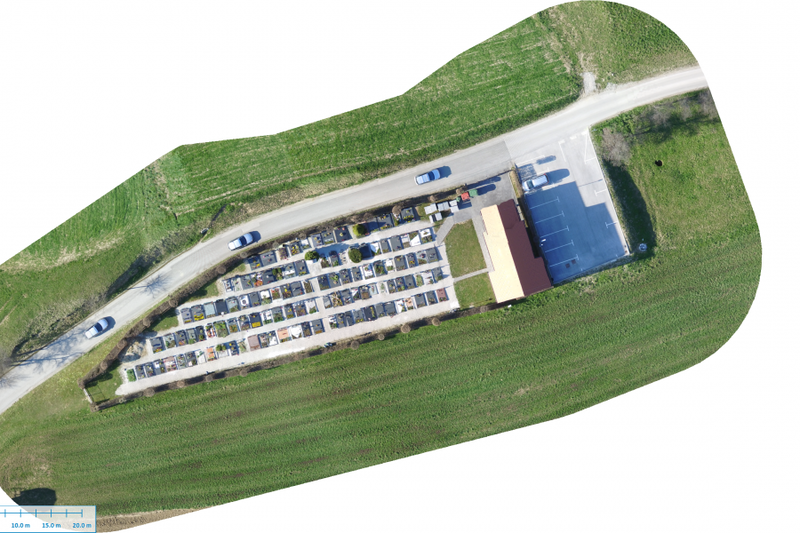 The time of aerial survey doubled, but with the low energy consumption of the aircraft, the battery’s autonomy was sufficient for the entire flight. 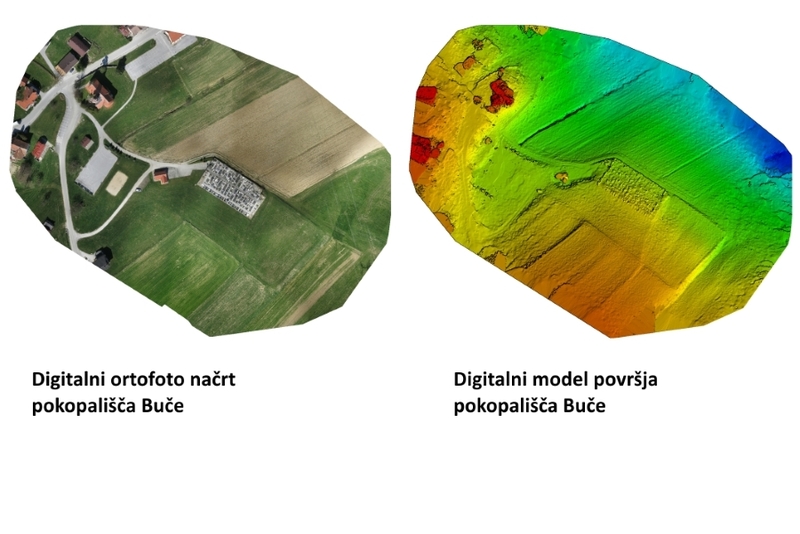 After processing stereo pairs of aerial photos by means of photogrammetric procedures of image matching, we created a 3D point cloud, which was followed by a Digital Terrain Model (DTM) in the form of a raster and metric 3D model of the surface under examination. 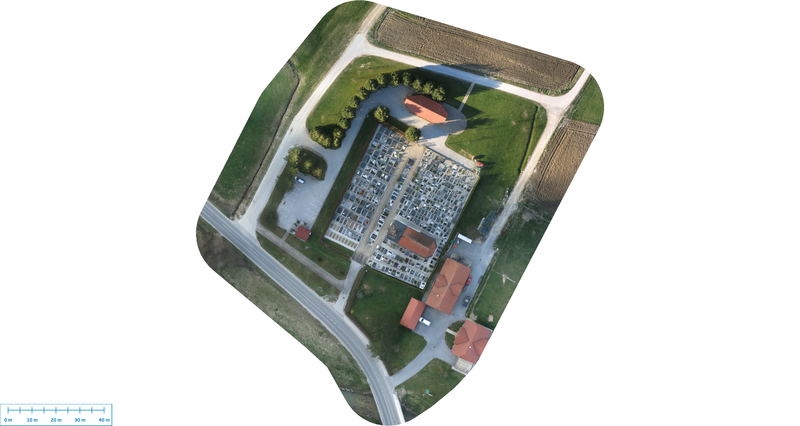 We used all this to create a flat orthophoto map that is of better quality and higher resolution than the old material. 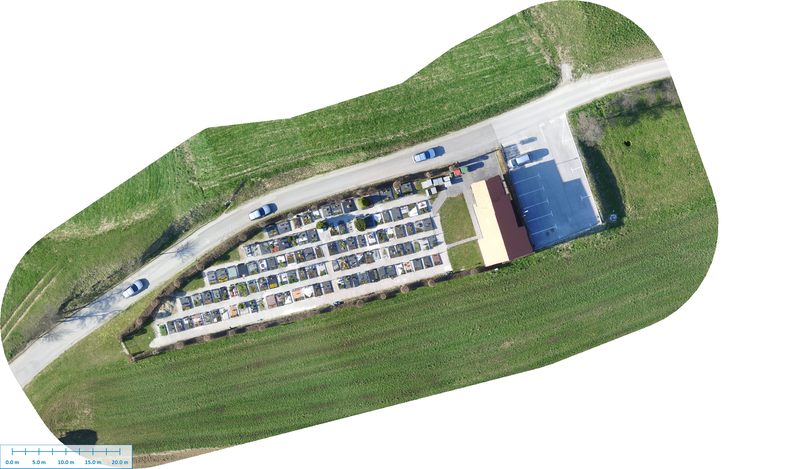 We achieved the new orthopoto map resolution 2.5 cm/px. 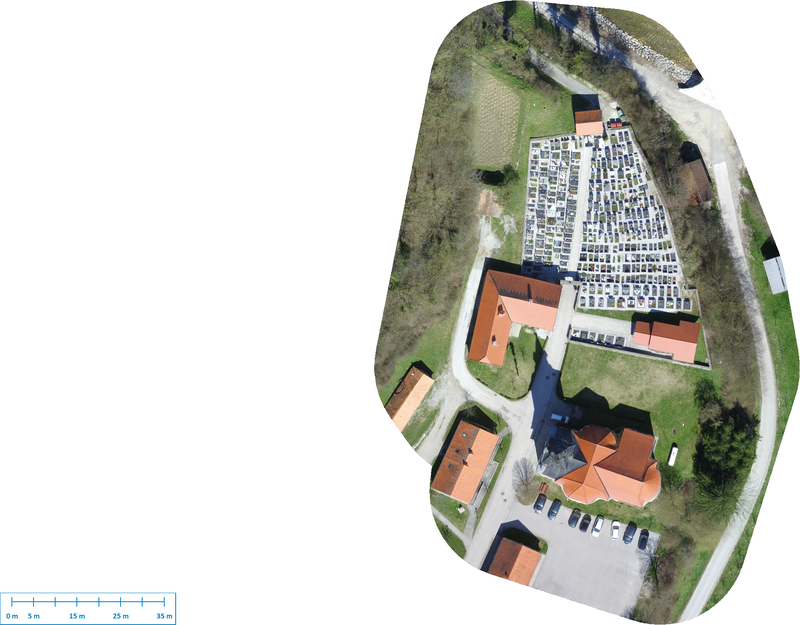 With the cloud dots thickening procedures we could produce a very precise digital surface model (DMP) and from it a complete orthophoto map (true orthophoto) of a particular cemetery. 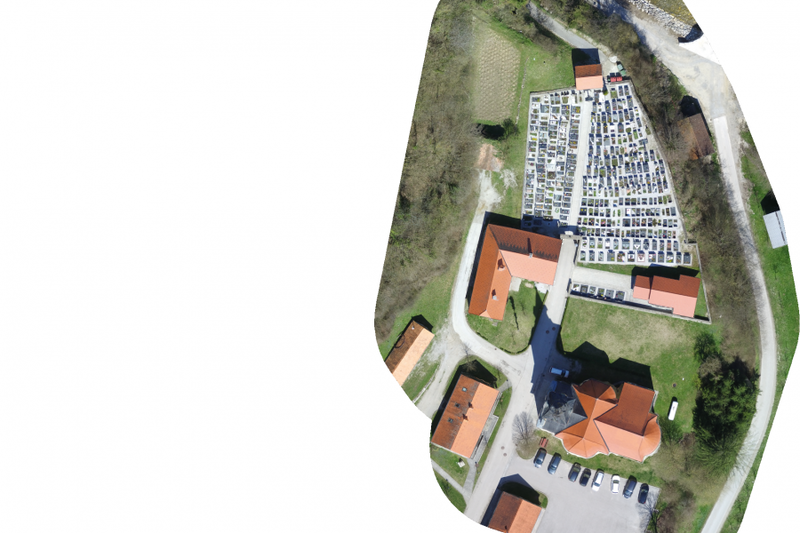 Thus we could achieve the absolute orthogonality of the cemetery facilities, for example cemetery fences, church bell towers, mortuary roofs and other facilities. 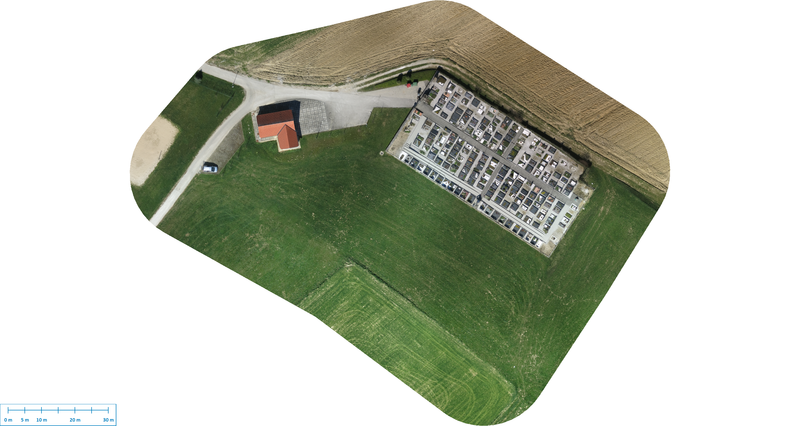 All of these objects are only visible from the bird’s-eye view on the new orthophoto map, while their lateral walls are not shown in the pictures and do not obscure the view of the graves surrounding. 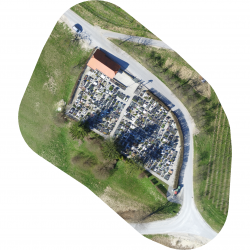 The updated orthophoto maps are an important element in the spatial information system PISO Cemeteries. 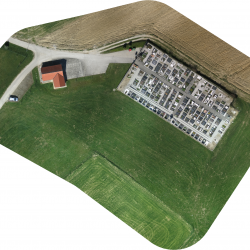 For its efficient operation in the management of data on graves, their tenants, calculation of rents and other services the acquired quality geospatial data is of key importance for users in municipalities and their municipal companies. 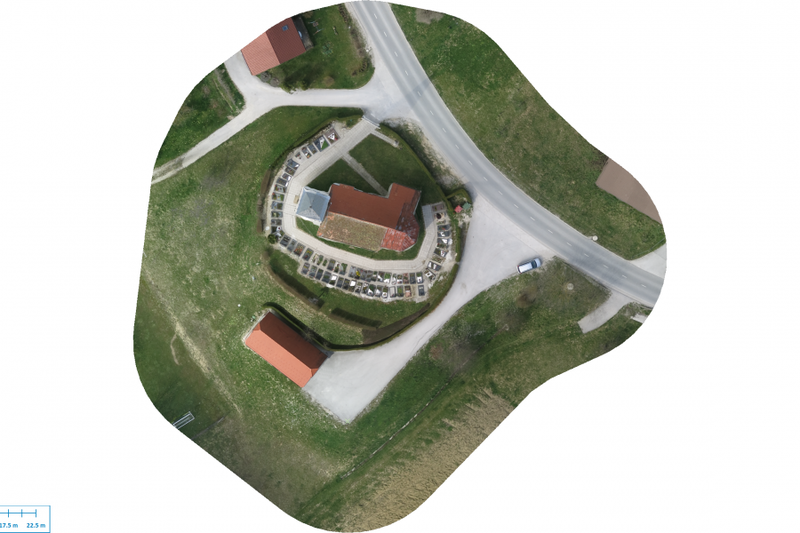 Geospace is Geavis' collection of domestic and foreign web contents describing the adventures of those small civil unmanned drones, the application aspects of aerial photography and geospatial challenges for the benefit of life and business.